The large dining room overlooks the majestic rural Matakana landscape and is surrounded by manicured lawns, courtyards and a Garden Bar. Macrocarpa beams, modern rustic fittings and vintage furniture give the venue a timeless, charismatic charm. Our team of hospitality professionals have years of experience to advise & help organise your wedding from the very beginning. A venue to suit all seasons. The Stables is your blank canvas for the wedding of your dreams. The Stables is nestled in between some of New Zealand's most beautiful surroundings. 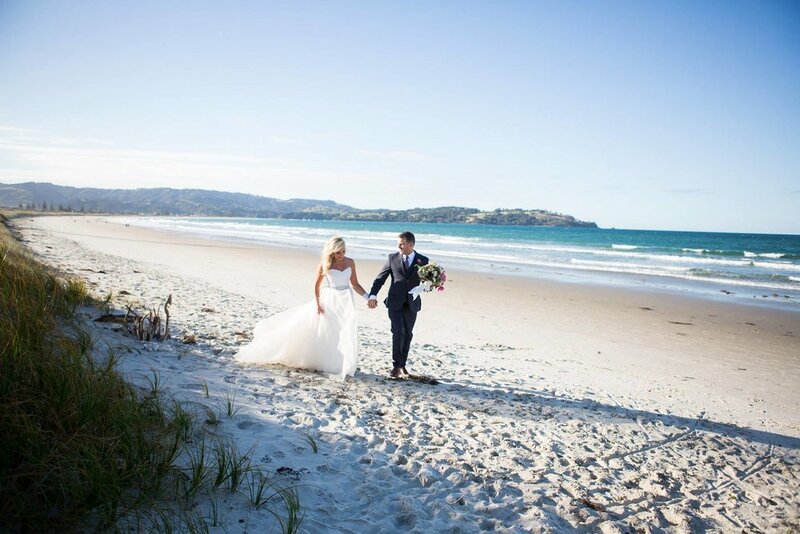 A perfect blend of rural countryside and magical beaches only minutes away from the venue. The vast lawns at The Stables are included in the venue hire. Take advantage of the natural beauty of the countryside offering a picturesque backdrop for your wedding ceremony. Or in winter, the indoor fireplaces make a beautiful, warm setting for you to take your vows with plenty of room for your friends and family to be a part of. The large dining room can accommodate up to 150 guests. A wonderful summer wedding venue with large glass doors that open onto the courtyard and expansive front lawns. Alternately, The Stables provides a beautiful winter wedding venue with heated floors, warm lighting and grand fireplaces that glow at each end of the dining room creating a comfortable, cozy atmosphere in winter. This is the fun part. Choose your own table layout & colours to create your own theme & style. Rustic, vintage, elegant, simple, fancy, dark, light, what suits you? We can make it happen. You can decorate the place with as much or as little as you want. Talk to us about your dream look, we can point you in the right direction! 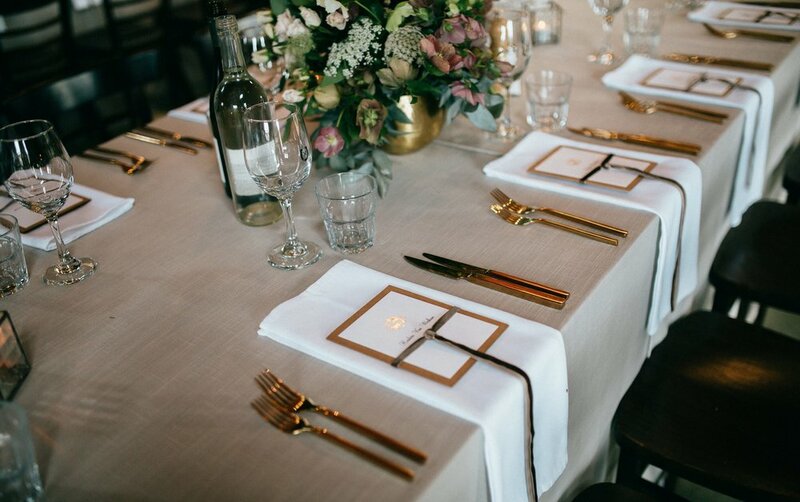 Choose from herringbone style or banquet, natural macrocarpa wood tables or linen. Up to you! We take pride in our food and food is our passion. Our experienced team of chefs deliver spectacular, tasty dishes and have the skill to cater to any dietary requirements you may need. Impress your guests with our 4 course dining menu included in your wedding package. Talk to us about our seasonal menu items and service options that suit you. We are a fully licensed venue with a fully stocked and operational bar. A variety of beers, wines, champagnes and non alcoholic options to choose from. Talk to us about your favourite drinks and our bartenders will be sure to take care of you! No worries! Let us do the work. Our Wedding Pack makes the planning simple and fun. We're here with you every step of the way and will make sure your wedding experience is amazing and unforgettable. Memories last forever and our venue will blow your mind how it transforms from a ceremony on the lawn in the sunshine to a great party venue at night. There are lots of ways to add a personal touch to your wedding. Arrive in style by classic car and park right up on our lawns! There are lots of fun and unique options to talk to us about. Whether it be a beautiful wooden archway for your ceremony or vintage wine barrels significant to the area, we have a lovely range of complimenting props to add to the overall set up. All free to use. You will even see our kissing booth around the place! We know how important your cute & cuddly best friend is and we wouldn't want him or her to miss your special day! As long as they are under control dogs are allowed on our lawns and to be a part of your wedding day. Rain...not a problem. Our covered courtyard area turns into a beautiful ceremony location with the lawns and NZ countryside as your backdrop. Other options include inside in front of the grand fireplace or at St.Andrews Church. While your guests are enjoying champagne and canapes, have fun with your bridal party and take advantage of great photo opportunities around the area. The Stables and The Country Park have 50 acres of land that reflects beautiful rural New Zealand in Matakana. Or just 5 minutes down the road there are stunning coastal views and white sand beaches. Add another personal touch to the venue. Amazing designer furniture for inside and outside. Talk to us about arranging your hair, make up and nails for your special day using our package discounts. There are plenty of local beauty boutiques who we work with and they will make sure you're looking fabulous and enjoying a bit of pampering! Every wedding needs a dance floor. Time to forget the formalities and let loose! The venue transforms into a great party spot at night. Talk to us about live bands, DJ's or sound system hire. We have some great affordable recommendations. On site at The Matakana Country Park, surrounded by manicured lawns and palm trees is a beautiful vintage church, available as an alternative option for your ceremony. Talk to us about hiring this and organising a celebrant. Complete that vintage look and arrive by Horse & Carriage! The Stables overlooks an equestrian park. Talk to us about how we can organise your special ride or inviting the horses to appear on the day. Leave the organising of your special day transport, for you and your guests to the team at the Concierge Passenger Service. Providing shuttle service, taxi rides, wedding cars, luxury coaches and vehicles. Accommodation, shops, cafes & restaurants all at your fingertips just minutes from The Stables. Plenty of things for your guests to see and do before and after your big day. We can recommend some nice, affordable accommodation options at discounted rates. Your team hosted the best ever Wedding banquet I have ever experienced. The venue, food and staff were all sublime beyond compare. The hors d’oeuvres were superb, plentiful and served at just the right temperature by charming staff. The “alternate drop” entrees, mains and desserts were all delicious and served at absolutely the best time in the unfolding programme. Serving all of your guests so swiftly was a magnificent feat. I had the eye fillet - exquisite, as if cooked for an individual in a five star restaurant. By the generosity of my companions I also sampled the pork belly and meat balls as well as the chicken main - scrumptious, generous, imaginative. I delighted in the whole atmosphere - roaring fires, candles, the charm and good natures of the staff. All in all it was a most wonderful range of experiences. Also a decent PA system so we could all hear that was being said - a rare treat. Thanks to Karma, Woody and the team for helping to make our wedding such a great day! We are still getting comments on how great the food was! My husband and I are regular customers of The Stables, so when we were looking for a venue for our wedding, The Stables seemed like the perfect choice. Steph and the team did a fantastic job of looking after us and our guests during the wedding. They were happy to accommodate all of our requests regardless of difficultly. They also did a fantastic job of providing advice and managing us to ensure the day went smoothly. Of the actual night, the maitre d’ was awesome, the food and wine was delicious, the venue itself looked fantastic, all of our guests had such a great time. My husband was talking to the manager after the wedding and he was saying that it was booking up really quickly, so if you considering it, definitely get in touch. You will have such a memorable wedding.